SCENARIO: we’ve all just watched Wisconsin complete a truly remarkable tournament run with their two best games of the season right here in the Final Four. The 7th-seeded Badgers have just beaten Gonzaga, 64-54, after beating Duke in the national semifinal, 61-57. 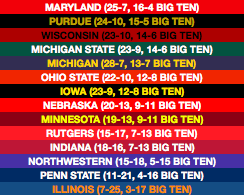 Big Ten: It’s a very chaotic end to the Big Ten’s season. In a surprising twist, Maryland wins out through the regular season, including a sweep of Michigan. Michigan and Michigan State, the current favorites and co-leaders with Purdue, combine to go 9-9 over the rest of their schedules. Michigan in particular loses five straight to fall out of the AP poll entirely, but they rebound to win the conference tournament and wind up with a 4 seed. WCC: A bit on Gonzaga (since they’re national finalists) and the rest of their conference. It’s about 50/50 at this point whether Gonzaga is able to finish out the remaining eight games of the season undefeated, and this time they don’t quite get there, taking a surprising loss at Loyola Marymount on Valentine’s Day. 28-3 headed into conference tournament week leaves them positioned for a 1 seed, but it’s all thrown up in the air when they lose to San Francisco in the WCC semifinals. The WCC final between USF and St. Mary’s is a game in which the winner would be worthy of an at-large, but the loser would just miss out, and it’s the Gaels who take it. 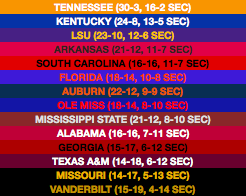 SEC: Tennessee is the team du jour in the SEC, and all across America at the moment, and aside from a shocking home loss to South Carolina on February 13, they live up to the hype. The Vols only lose one other game pre-tournament, at LSU later on, and win the SEC tournament to secure their #1 seed. LSU struggles from here on out, going .500 in their remaining games, but that’s enough for them to finish third & get a six seed. 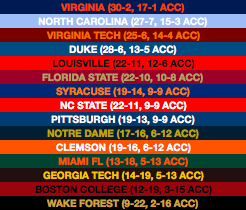 ACC: Virginia is a clear #1 seed going in to the tournament. The Hoos win out through the regular season and only fall to Duke in the ACC tournament semifinals, going 30-2. Yes, I said semifinals, because the Dukies have a tough go of the rest of the season, losing competitive games to Louisville, Virginia, Virginia Tech and North Carolina, putting them at 13-5 in ACC play. Virginia Tech also closes the season excellently, beating Louisville and Duke on their way to a #2 seed. Big XII: The Big XII does a pretty good job of cannibalizing itself during this sim, with Texas Tech winning the conference 13-5. Kansas finished a ways behind at 9-9, ending their streak of conference championships. Despite not having a team on the top three seed lines, the conference gets eight of its ten teams into the tournament. Big East: Not much to say about this one – in real life, Villanova and Marquette are both four games ahead of everyone else, and although St John’s makes a charge, winning eight of their last nine, the top two remain the top two. St John’s does get a happy ending, though, with wins over both of those teams in the conference tournament. That late-season surge gets them a fairly unexpected 5 seed. 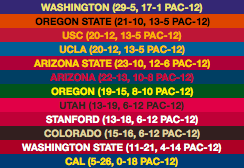 Pac-12: Pretty good outcome for the Pac-12 in this sim, as Washington nearly goes undefeated in conference play. Only a loss to Oregon State in the last week of the regular season stops that from happening, and that’s one of the main reasons that second-place OSU sneaks into the tournament as one of the last four in. The 4-5 tournament quarterfinal is also probably a play-in game for the tournament, and that’s won by Arizona State, making 3 bids for the league. 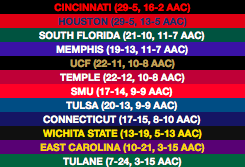 AAC: Cincinnati nearly won out for the rest of the regular season, only losing to Houston in the final game, but then losing to them again in the final of the conference tourney. In the end, that means that both of them finished with a 29-5 record, & both of them are 3-seeds. Here’s the tournament! The second and third-biggest upsets of this whole tournament happened in the Final Four – not something I had expected to see, but when Wisconsin prevails in a Final Four with Duke, Gonzaga and Virginia, that’s definitely true. Thanks for reading along, y’all, and I hope you had a good week! I’ll be back with a new Power Rankings post tomorrow.